Can This Prevent Prostate Cancer? In honor of Prostate Awareness Month, let’s talk about some new recommendations released this month by Prostate Cancer Canada. The recommendations come on the heels of recent statistics about prostate cancer: one in seven men will get the disease and it’s the second most common cause of death from cancer among white, African American, American Indian/Alaska Native, and Hispanic men. The recommendations from Prostate Cancer Canada (PCC) include men getting a baseline PSA test in their 40s instead of waiting until their 50s. The PSA remains an important test for discovering signs of prostate cancer as there are often no symptoms at all in the early stages of the disease. In the course of conducting a survey, PCC found that almost 50% of men are reluctant to get the PSA test. Most, it seems are fearful of having to undergo treatment. In both Canada and the U.S., researchers have been searching for ways to better treat and fight prostate cancer. An increasing amount of attention has been focused on complementary and alternative treatments, in part, because prostate cancer can often be a slow-moving disease. CAM treatments such as antioxidants, pomegranate extract, green tea, turmeric, resveratrol, silibinin, and herbs are being used either alone, or in conjunction with Western drug therapies. Some of these therapies have shown success in clinical trials, while others are waiting further long term testing in well-constructed studies. Now, researchers from the University of Florida are adding another potential CAM therapy to that list. They are suggesting that a compound extracted from seaweed off the coast of Florida, may be a new line of defense against prostate cancer. The Florida research team vetted a number of different seaweeds for prostate cancer-fighting potential but found that compounds in sea lettuce showed the best results. 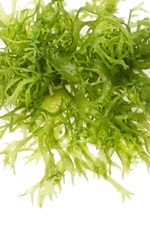 Sea lettuce is a staple of the Asian diet, where prostate cancer risk is much lower. The researchers identified the specific mechanisms that give sea lettuce its antitumor capabilities. The seaweed ups the body’s antioxidant defense system, helping it to fight off disease with greater efficiency—and that includes cancer. This effect seems to be most powerful when pitted against prostate cancer cells. Fruits exert a similar anti-cancer effect by scavenging free radicals and eliminating them. Compounds in sea lettuce worked to stop cancer from growing in a different way, however. Instead of the direct interaction that fruit antioxidants have against free radicals, sea lettuce compounds increase levels of a whole group of antioxidant enzymes. The compounds also boost levels of antioxidants inside individual cells. These two protective factors combined create a long-lasting shield against any cancer cells that try to take hold. These antioxidant enzymes are regulated by your DNA. The Florida researchers think that the antioxidant enzyme activity of sea lettuce makes it a great candidate for a natural cancer-prevention supplement. The researchers hope that further studies will help shed light on the dosage and potency of sea lettuce compounds needed to protect against prostate cancer. Homewood, L., et al., “Compound discovered in Florida Keys shows early promise as colon cancer treatment,” University of Florida web site, Sept. 29, 2013. Klempner, S.J., et al., “Complementary and alternative medicines in prostate cancer: from bench to bedside?” Oncologist 2012; 17(6): 830-7. “Prostate Cancer Canada Releases New Recommendations,” Prostate Cancer Canada web site, Sept. 4, 2013; http://prostatecancer.ca/In-The-News/Foundation-News-Releases/Prostate-Cancer-Canada-Releases-New-Recommendation#.UjC1X8aUSmQ, last accessed Sept. 13, 2013.